Siemens Healthineers debuted a new SPECT/CT system, the Symbia Intevo Bold, at the 2017 annual meeting of the Society of Nuclear Medicine & Molecular Imaging (SNMMI) held this month in Denver. The system combines single-photon emission computed tomography (SPECT) technologies with new, high-performance CT capabilities to enable a wide range of clinical applications. The Symbia Intevo Bold is designed for SPECT/CT systems in a dual-use setting. It is designed to help maximize efficiency for SPECT patients who also require a diagnostic CT scan and can be used as a standalone or backup diagnostic CT system. The SAFIRE2 (Sinogram Affirmed Iterative Reconstruction) algorithm, which delivers excellent CT image quality while reducing patient radiation dose by as much as 60 percent. SAFIRE enables fast image reconstruction for easy implementation and reduces noise while maintaining detail visualization. The iMAR3 (Iterative Metal Artifact Reduction) algorithm, which reduces metal-related artifacts caused by metallic materials such orthopedic and dental implants. This capability reduces or eliminates artifact-induced distortion in CT images and canapply the CT images for attenuation correction to provide a more enhanced, accurate SPECT image. An optional IVR (interleaved volume reconstruction) feature reconstructs overlapping CT images up to 32 slices to extract the maximum amount of diagnostic information from measured data, enabling evaluation of small structures such as lesions or fractures. IVR improves spatial resolution in the z-direction of all CT scans, regardless of pitch. The single-source dual energy capability employs two sequential spiral CT scans operating at different kV levels to combine tissue information with disease morphology, improving image quality. Post-processing applications using syngo Dual Energy software include monoenergetic, Calculi Characterization, and gout. For SPECT imaging, SPECT Quant4 quantification technology enables automated, accurate, and reproducible quantification of Technetium-99m , Iodine-123, Lutetium-1775, and Indium-111. This capability extends the use of advanced SPECT quantification from general nuclear medicine and bone studies to indications including neurological disorders, neuroendocrine tumors, and prostate cancer. 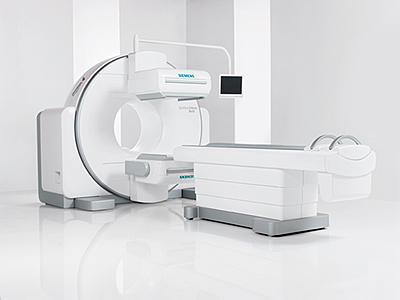 Siemens Healthineers debut new SPECT/CT system. Appl Radiol.